Mouse CD1.1 is an MHC class I-like, non-MHC-encoded, surface glycoprotein that can be recognized by T cells, in particular NK1.1+ T cells, a subset of αβ T cells with semiinvariant TCRs that promptly releases potent cytokines such as IL-4 and IFN-γ upon stimulation. To gain insight into the function of CD1.1, a panel of nine mAbs was generated and used to biochemically characterize and monitor the surface expression of CD1.1 on different cell types. CD1.1 is a heavily glycosylated, β2-microglobulin-associated surface protein. Its recognition by a panel of 12 Vα14-positive and -negative CD1-specific αβ T cell hybridomas was blocked by two groups of mAbs that bound to adjacent clusters of epitopes, indicating that different αβ TCRs bind to the same region of CD1.1, presumably above the groove. Remarkably, CD1.1 was mainly expressed by dendritic cells, B cells, and macrophages, suggesting a function in Ag presentation to Th cells. Furthermore, the cell type that expressed the highest levels of CD1.1 was the splenic marginal zone B cell, a distinct subset of B cells that also expresses CD21 (the C3d receptor) and may be involved in natural responses to bacterial Ags. Altogether, the results support the idea that CD1.1 may function in recruiting a form of innate help from specialized cytokine producer αβ T cells to APCs, a role that might be important at the preadaptive phase of immune responses to some microbial pathogens. The mouse CD1 locus contains a pair of highly homologous genes, CD1.1 and CD1.2, that encode conserved MHC-like β2-microglobulin (β2m3)-associated molecules that are the homologues of CD1d, one of five human CD1 isotypes (1, 2, 3, 4, 5). Although the function of CD1 remains elusive, several observations recently suggested that it might perform specialized functions of Ag presentation to specialized αβ T cells. Human CD1b-expressing monocytic and dendritic cells could present mycobacterial lipids loaded in an endosomal compartment to double negative αβ T cells (6, 7, 8). In addition, elucidation of the structure of mouse CD1.1 revealed a very hydrophobic groove that could potentially accommodate hydrophobic lipid or peptide ligands (9). Indeed, a set of synthetic peptides containing a hydrophobic motif was shown to bind to CD1.1 in vitro (10). Although CD1-specific cells expressing variable TCR α- and β-chains have been reported (11), a remarkable feature of the mouse system and its human CD1d homologue is the existence of a conserved set of CD1-specific T cells that utilize TCRs made of an invariant Vα14-Jα281 (human Vα24-JQ) α-chain paired with distinct families of TCRβ-chains such as mouse Vβ8 (human Vβ11) (12, 13). These CD1-specific αβ T cells, which are CD4-positive or CD4/CD8-negative, also express NK receptors and have been referred to as NK1.1+ T cells (5, 14, 15). Mouse (16, 17) and human (18) CD1-specific cells exhibit a high frequency of autoreactivity to CD1-expressing cells, and are dependent on CD1 for selection (19, 20, 21). Their unusual property of very rapidly releasing potent cytokines such as IL-4 and IFN-γ upon TCR engagement has led to the speculation that they might constitute an innate regulatory or effector immune pathway, but the conditions and consequences of their recruitment in vivo remain undefined. Previous experiments established that CD1 is mainly expressed by cells of hemopoietic origin and by hepatocytes (4, 22, 23, 24, 25). We have now generated a panel of nine anti-CD1 mAbs and examined the form and the pattern of CD1.1 and CD1.2 surface expression by hemopoietic cells. The CD1.1 and CD1.2 genes are 95% identical, yet are differentially transcribed in different tissues (23). Although most mAbs recognized the products of both the CD1.1 and CD1.2 genes, we were able to focus on CD1.1 by making use of our observation that the C57BL/6 strain only expresses CD1.1 (50). The results presented in this paper demonstrate that CD1.1 is expressed as a heavily glycosylated, β2m-associated protein in transfected lines as well as in fresh mouse CD1-expressing cells. Five mAbs that blocked CD1.1 recognition by all members of a panel of 12 CD1-specific T cell hybrids delineated two adjacent clusters of CD1.1 epitopes, presumably centered around the groove. In strong support of the hypothesis that CD1.1 is directly or indirectly involved in Ag presentation to Th cells, we found that it was conspicuously expressed at high levels on dendritic cells, MHC class II+ macrophages, and B cells. In addition, we identified the splenic marginal zone B (MZB) cell, a minor subset of B lymphocytes that is believed to be involved in the natural response to complement-coated bacterial Ags, as the cell type that expressed the highest constitutive levels of CD1.1. These results further support the idea that NK1.1 T cells and other CD1-specific cells might be involved in some form of innate immunity to microbial pathogens. C57BL/6-, C57BL/6.β2m-deficient (26) (backcrossed 10 times to C57BL/6), and C57BL/6.TAP-1-deficient (27) mice (backcrossed four times to C57BL/6) were maintained under specific pathogen-free conditions in our barrier facility. Other mouse strains were purchased from The Jackson Laboratory (Bar Harbor, ME). Male Wistar rats, purchased from Charles River (Wilmington, DE) were immunized with C57BL/6 thymocytes, boosted three times with the RBL-CD1.1-transfected rat cell line, once with BALB/c thymocytes, and received a final boost with CR1-CD1.1 cells 3 days before fusion with Sp2/0. Hybridoma supernatants were screened for CD1 specificity by FACS analysis on CD1.1-transfected and untransfected cells. mAbs were purified using protein G beads (Pharmacia Biotech, Piscataway, NJ). For flow cytometry, purified mAbs were biotinylated with aminohexannoyl-biotin N-hydroxy Succinimide ester (Zymed, San Francisco, CA). Ab isotypes were determined by flow cytometry using rat isotype-specific reagents (Caltag, San Francisco, CA). The derivation and characterization of the CD1.1-specific T cell hybridomas has been described in detail elsewhere (13, 17).4 Stimulation by CD1.1-expressing thymocytes or splenocytes was assayed by measuring the IL-2 released in the supernatant of 24-h cultures as described (13, 17). Ab blocking was performed with 2 μg/ml of purified mAbs, a concentration that did not affect the stimulation of a CD1-unreactive control T cell hybridoma. Cell surface proteins were biotinylated with 0.5 mg/ml sulfo-NHS-SS-biotin (Pierce, Rockford, IL) for 30 min at room temperature. In metabolic labeling experiments, cells were pulsed for 2 h with 1 mCi of 35S-cysteine/methionine (Pro-Mix; Amersham, Arlington Heights, IL) per 1 to 2 × 107 cells. In some cases, cells were previously cultured for 12 h in medium containing 1 μg/ml of tunicamycin (Calbiochem, La Jolla, CA) to prevent addition of N-linked carbohydrates. Labeled cells were then harvested after treatment with 0.05% trypsin (Biofluids, Rockville, MD), and washed twice in PBS before lysing in 10 mM Tris, pH 7.4, 150 mM NaCl, 1% Triton X-100 at 5 × 107 cells per ml for 20 min at 4°C. Nuclei were removed by pelleting immediately after lysis and the lysate precleared overnight on Protein G beads (Pharmacia) coated with an irrelevant isotype-matched Ab. Specific immunoprecipitation was conducted for 3 h at 4°C by incubation with mAb-coated Protein G beads, and immunoprecipitates washed twice with 50 mM Tris, pH 7.4, 100 mM NaCl, 2 mM EDTA, 2% Triton X-100 and once with 50 mM Tris, pH 8.0, 120 mM NaCl, 0.5% Nonidet P-40. Beads were resuspended in loading buffer (10 mM Tris, pH 8.0, 1 mM EDTA, 2.5% SDS, 20% glycerol, bromophenol blue) and boiled for 5 min before loading onto SDS-PAGE gels. Biotinylated anti-CD1 Abs were prepared as described above and titrated to establish optimal concentrations for use in flow cytometry. Anti-B220-CyChrome (RA6-3B2), -CD5-FITC (53-7.3), -CD8-FITC (53-6.7), -CD11b-FITC (M1/70), -CD11c-FITC (HL3), -CD21-FITC (7G6), -CD23-FITC (B3B4), -HSA-FITC (M1/69), -I-Ab-FITC (Y3P), -IgM-FITC (R6-60.2), and -CD1-biotin (1B1) were purchased from PharMingen (San Diego, CA). 3C11 anti-CD1 was a gift of Dr. Terhorst (Harvard Medical School, Boston, MA). Anti-CD4-tricolor (CT-CD4) and streptavidin-phycoerythrin (PE) were purchased from Caltag. Multicolor staining was conducted after FcR blocking with 2.4G2 (American Type Culture Collection, Rockville, MD), and analysis was performed on a FACScan (Becton Dickinson, San Jose, CA) using Cellquest software (Becton Dickinson). Analyses presented as panel sets of a given figure are from the same experiment so that fluorescence intensities can be compared. Comparison of relative levels of CD1.1 were made using the mean fluorescence intensity of the histogram profiles on a FACScan calibrated with standard fluorescent beads. For competition experiments, purified blocking Abs were used at 30-fold or greater excess over the biotinylated Abs. Enriched dendritic cell populations were prepared by adherence/de-adherence of spleen cells on plastic culture dishes as described (28). Preparation and staining of frozen C57BL/6- and CD1-deficient spleen sections were conducted as previously described (29) using PNA-HRP (ICN, Costa Mesa, CA) and 19G11-biotin detected with streptavidin-alkaline phosphatase (Southern Biotechnology Associates, Birmingham, AL). A total of nine hybridomas specific for CD1.1-transfected cells was isolated, eight of which were IgG2b and one IgG1 (20H2). All mAbs cross-reacted onto CD1.2-transfected cells, except 15F7 (not shown). However, we have observed that the C57BL/6 mouse strain carries a frameshift mutation at the 5′ end of the exon encoding the α3 domain4 that is predicted to abolish surface expression. Since all experiments reported in this paper utilized cells from the C57BL/6 strain, the analysis is focused on CD1.1, thereby avoiding the ambiguities that might arise from the simultaneous detection of the products of two differently regulated genes. As reported previously by others (22, 30) and shown in Figure 1⇓ for a representative mAb, 19G11, staining of β2m knockout thymocytes was reduced by at least 10-fold, down to almost background levels for nine of nine anti-CD1.1 mAbs, whereas staining of TAP knockout cells was unaltered. A similar result was obtained with spleen cells (not shown). These results therefore further support the conclusion that CD1.1 depends on β2m but does not require TAP-dependent peptide loading for surface expression. It remains possible, however, that a β2m-independent form of CD1 that would escape detection by all nine mAbs exists at the surface of some cell types (31). Characterization of CD1.1-specific mAbs. A, FACS profiles of thymocytes from wild-type, β2m-deficient, and TAP-1-deficient C57BL/6 mice stained with biotinylated anti-CD1 mAb 19G11 and streptavidin-PE. 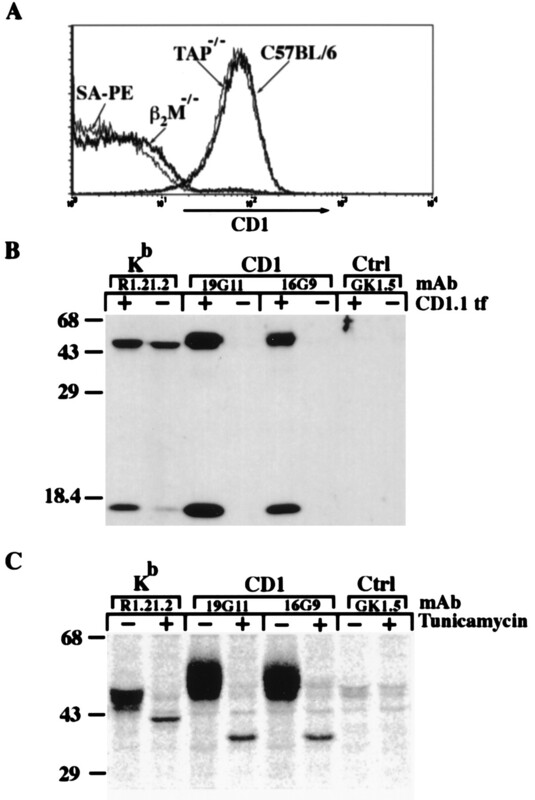 B, Immunoprecipitation of surface-biotinylated proteins with anti-CD1.1 (19G11), anti-Kb (R1.21.2), or control anti-CD4 (GK1.5) rat IgG2b mAbs in CD1.1-transfected or untransfected C57SV cells (mouse C57BL/6 fibroblastic line). Immunoprecipitated material was size separated on a 12.5% reducing gel, blotted to a membrane, and detected by the addition of streptavidin-horseradish peroxidase. C, Immunoprecipitation of metabolically labeled C57SV-CD1.1 cells grown either in the presence (+) or absence (−) of the N-linked glycosylation inhibitor tunicamycin. Immunoprecipitated material was size separated on a 10% reducing gel and detected using a PhosphorImager. Immunoprecipitation of surface-biotinylated C57SV-CD1.1 cell lysates revealed a heavy chain of heterogeneous (49–58 kDa) size and a light chain of approximately 12 kDa, consistent with a heavily glycosylated CD1.1 protein associated with β2m. This is shown in Figure 1⇑B for two mAbs and was observed with all mAbs (not shown). The larger size of the immunoprecipitated heavy chain band relative to the predicted 36 kDa size of an unmodified CD1.1 protein has been previously reported to be due to N-linked glycosylation based upon Endo F treatment experiments (25). Likewise, when CD1.1 was immunoprecipitated from fresh, biotin-labeled C57BL/6 thymocytes, we also observed a highly glycosylated heavy chain and β2m (data not shown). The very high level of glycosylation of CD1.1 raised the possibility that some mAbs recognized only a subset of surface CD1.1 molecules based upon their particular glycosylation status. To test whether recognition of CD1.1 by the anti-CD1 mAbs of our panel was dependent upon N-linked carbohydrates, CD1.1 was immunoprecipitated from metabolically labeled C57SV-CD1.1 grown in the presence of tunicamycin. Tunicamycin blocks the transfer of N-linked carbohydrate to the protein. Thus, protein synthesized in the presence of tunicamycin lacks N-linked carbohydrate. As shown in Figure 1⇑C for 19G11 and 16G9 (and also observed with each of two additional mAbs, 20H2 and 14F5), immunoprecipitates of lysates from metabolically labeled tunicamycin-treated C57SV-CD1.1 cells resulted in a sharp 36-kDa band as predicted for the core CD1.1 protein (Fig. 1⇑C). The isotype-matched anti-Kb mAb R1.21.2 immunoprecipitated the expected glycosylated (47-kDa) and unglycosylated (40-kDa) Kb heavy chain bands from the control and tunicamycin-treated cells, respectively. These results therefore suggest that these anti-CD1.1 mAbs are binding primarily to the core protein rather than to carbohydrate determinants. Using a flow cytometric competition assay, we next determined the spatial relationship of the epitopes recognized by the different Abs. Excess purified Abs were used as cold competitors for biotinylated Abs. In addition, the rat IgG2b anti-CD1 mAb 1B1 (22) that became commercially available during the course of this study, as well as the IgM anti-CD1 Ab 3C11 (detected by an anti-rat IgM reagent), were included in the competition analysis. A summary of the results, graphically presented in the upper panel of Figure 2⇓, identifies at least four distinct clusters of epitopes recognized by 3C11/1B1/14F5/15C6/17F5, 15F7/19G11/20H2, 16G9/4C4, and 19F8. Epitope mapping of CD1.1 recognition by TCRs and mAbs. 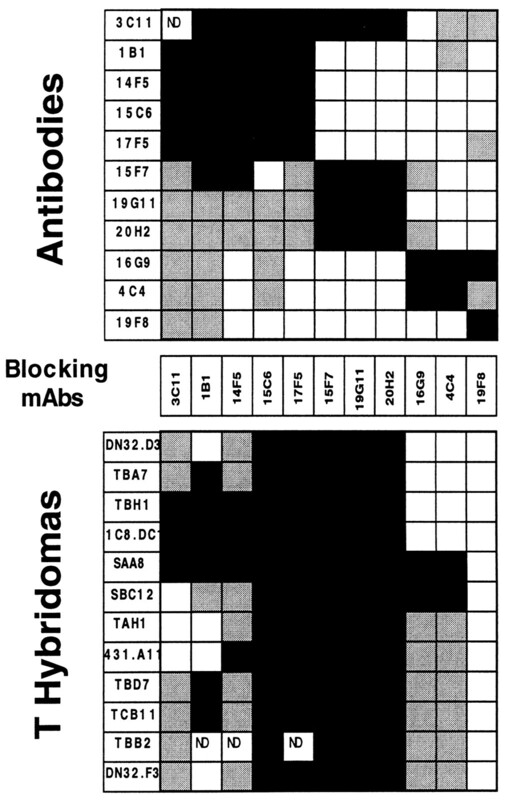 Upper panel, Cross-blocking mAb experiments delineate four epitope clusters. The degree of shading of the box indicates the level of blocking by a given Ab: black boxes represent >80% inhibition, gray boxes indicate a 40 to 80% inhibition, and white boxes indicate <40% inhibition. Lower panel, The ability of the different anti-CD1 Abs to block IL-2 release by a panel of CD1-specific T cell hybridomas was assessed by adding 2 μg/ml of purified mAb to cultures containing CD1.1-expressing splenocytes or thymocytes and CD1.1-specific T cell hybridomas. Levels of inhibition are indicated as above. We previously reported that 3C11, the first anti-CD1.1 mAb available, could block the stimulation of two CD1-specific T cell hybridomas by C57BL/6 thymocytes, but could not block a third one (13). One possible explanation for this split blocking pattern was that 3C11 did not recognize CD1.2 and therefore would not block T cell hybridomas that cross-reacted onto CD1.2. However, our recent observation that C57BL/6 mice only expressed CD1.1 due to a frameshift mutation in CD1.24 contradicted this hypothesis, suggesting instead that 3C11 either failed to bind the relevant form of CD1.1 (for example, differently glycosylated or ligand associated CD1.1) or that it bound to a region that did not contribute major interactions with the TCR of the resistant CD1-specific T cell hybridoma. Using our extended panels of 11 mAbs and 12 CD1-specific T cell hybridomas, we have now performed a systematic analysis of the patterns of mAb-mediated blocking of T cell recognition of CD1.1. The results are graphically summarized in the lower panel of Figure 2⇑. They indicate that only the five mAbs 15C6, 17F5, 15F7, 19G11, and 20H2 invariably blocked T cell recognition of CD1.1. These mAbs all belonged to two relatively well-demarcated clusters of epitopes (see black squares in Fig. 2⇑). Furthermore, the fact that some mAbs of one cluster could partially block binding of mAbs of the other cluster indicated that, although separate, the two clusters were adjacent. Altogether, the results support the conclusion that all αβ TCRs contact CD1.1 in the same region, presumably above the groove, and that the two mAb clusters are located at adjacent positions in this region. Conversely, 19F8, which defines its own cluster, failed to block CD1.1 recognition by any of the αβ TCRs, suggesting that its binding site is located away from the CD1.1 groove. Interestingly, several mAbs behaved like 3C11 in that they failed to block some CD1-specific TCRs and completely blocked others. This was unlikely to result simply from differences in binding affinities, as reciprocal patterns of blocking were observed. For example, the mAb 3C11 blocked 1C8.DC1 but not SBC12, whereas mAb 16G9 blocked SBC12 but not 1C8.DC1. Rather, in accordance with our demonstration that the mAbs bind to distinct regions of CD1.1, the results may suggest that different regions of CD1.1 contribute interactions of variable importance for binding of individual αβ TCRs. Alternatively, it is possible that a modified form of CD1.1 that is recognized by an individual TCR-αβ may not be recognized by a particular mAb. Although the tunicamycin experiments suggested that glycosylation did not modify CD1.1 binding by the members of the panel of anti-CD1.1 mAbs examined (19G11, 16G9, 14F5, and 20H2), the possibility that some mAbs recognize subsets of CD1.1 associated with particular ligands, as recently shown with anti-MHC II mAbs (32, 33), remains to be tested. Previous functional and expression assays indicated that CD1 was expressed by thymocytes and splenocytes (4, 22, 23, 25), although the relative levels of expression between different subsets of cells were not precisely compared or were obscured by limitations inherent to the use of a single mAb or by the potential recognition of both CD1.1 and CD1.2. In particular, the report that some CD1.1-specific T cell hybridomas recognized CD1.1-expressing thymocytes but not splenocytes suggested that CD1.1 was expressed at significantly lower levels by splenocytes. Surprisingly, however, histogram analyses of total lymphoid populations in the spleen and thymus stained with the various mAbs showed that a large proportion of splenocytes expressed CD1.1 at levels similar to those of thymocytes (Fig. 3⇓, compare A and B). Multicolor analysis using B cell- and T cell-specific markers allowed us to determine the relative levels of CD1.1 expression of B cells and T cells in the spleen (Fig. 3⇓, B–D and Fig. 4⇓C). Additional experiments have now established that CD1.1 recognition by some T cells is tissue and cell specific, so that there exist T cells that respond to CD1.1 expressed by cortical thymocytes and not B cells. Conversely, other T cells respond to B cells and not cortical thymocytes.4 Altogether, these results strongly suggest that it is preferential recognition of modified forms of CD1.1, possibly associated with tissue-specific self-ligands, rather than simple differences in CD1.1 expression levels that accounts for the differential responses of these T cell clones. Relative levels of CD1.1 expression by T cells. 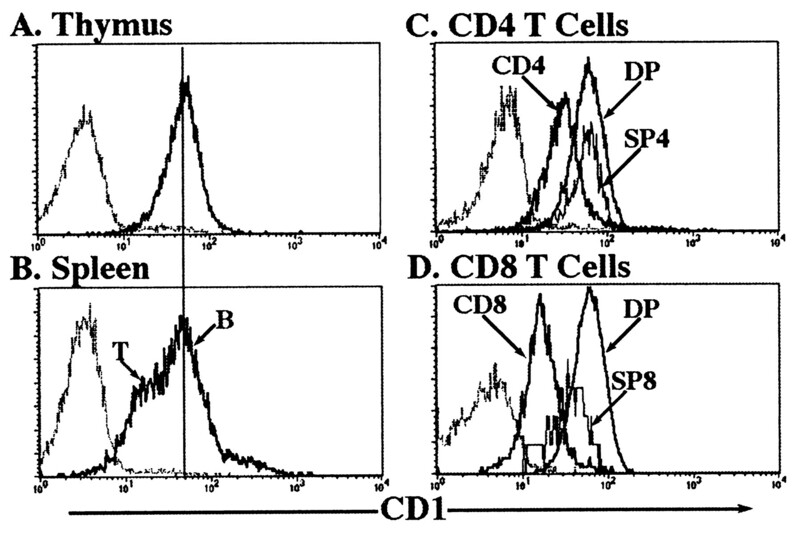 Leftmost profiles in each panel are control stainings with streptavidin-PE alone on total thymocytes (A), total splenocytes (B), CD4-gated splenocytes (C), and CD8-gated splenocytes (D). T and B cell components of the total spleen histogram were determined in separate multicolor experiments using B220 to identify B cells and CD5 or CD4+CD8 to identify T cells. Thymic and splenic T cell subsets were defined by costaining with CD4-tricolor and CD8-FITC. DP, thymic CD4/CD8 double-positive; SP4, thymic CD4 single-positive; SP8, thymic CD8 single-positive; CD4, splenic CD4 T cells; CD8, splenic CD8 T cells. CD1.1 expression by APCs. Splenic dendritic cells were generated by adherence/de-adherence on plastic culture dishes as described in Materials and Methods. Peritoneal macrophages were harvested by peritoneal lavage without elicitation and gated based on Mac-1 staining. Splenic B cells were identified by gating on B220+ cells. In all cases, FcR was blocked before cells were stained with anti-CD1-biotin (19G11) + streptavidin-PE. Control staining was with an isotype-matched anti-CD8-biotin mAb + streptavidin-PE on the same gated populations. 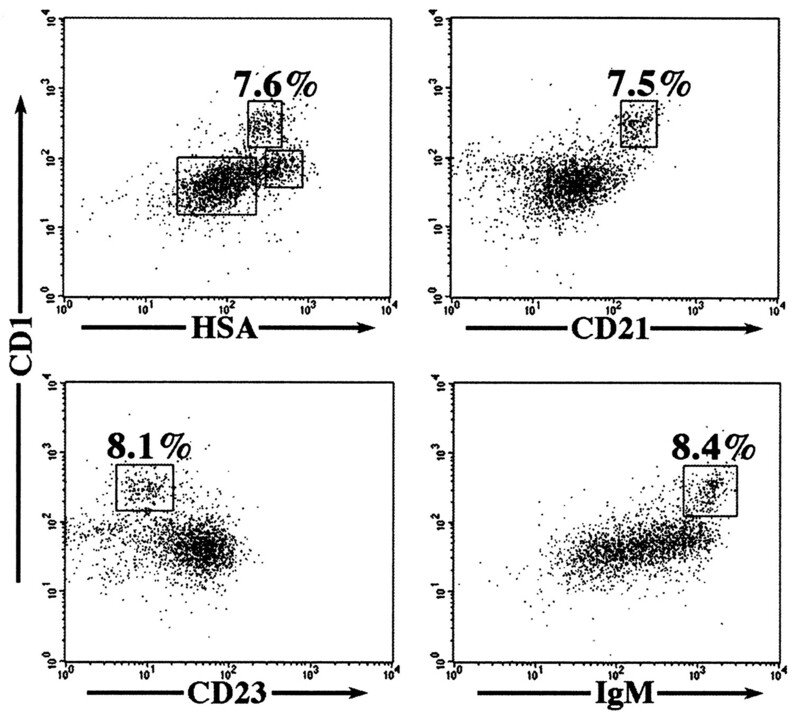 The inset in B showing a two-color dot plot of CD1 vs MHC class II I-A (Y3P-FITC) illustrates that macrophages expressing MHC class II have higher levels of CD1.1. The relative levels of CD1.1 expression on different populations of lymphoid cells were examined using at least one representative of each mAb cluster. There was little difference between the staining profiles obtained with the various mAbs, although 16G9 tended to stain thymocytes relatively less well than splenocytes (not shown). Results are therefore shown for 19G11, the mAb that consistently gave the brightest staining. 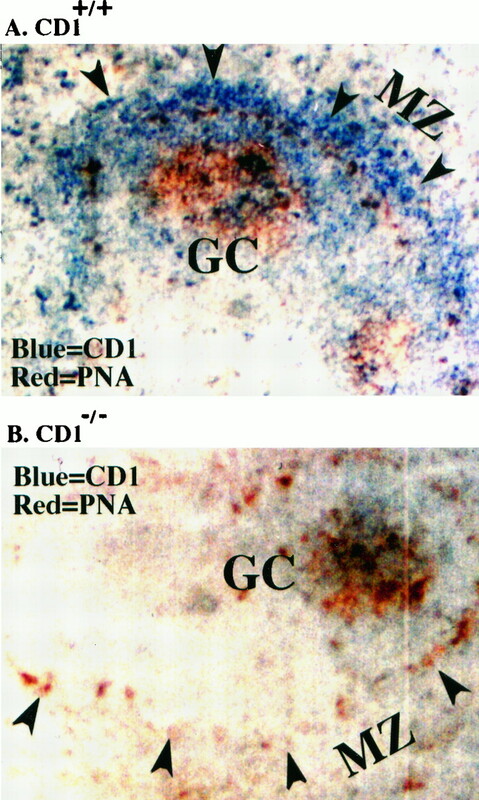 Figure 3⇑, C and D show that CD4/CD8 double positive (DP) thymocytes expressed high levels of CD1.1, single positive CD4 thymocytes expressed levels of CD1.1 similar to that of DP thymocytes, and single positive CD8 thymocytes expressed approximately twofold less CD1.1. Mature CD4 T cells found in peripheral organs such as spleen (CD4, Fig. 3⇑C) or lymph node (data not shown) had on average a twofold decrease in CD1.1 levels compared with DP and single positive CD4 thymocytes. Mature, peripheral CD8 T cells in the spleen (CD8, Fig. 3⇑D) or lymph node (data not shown) also showed a further twofold reduction in CD1.1 levels compared with single positive CD8 thymocytes. Thus, similar to what was previously reported for the various human CD1 isotypes (34), levels of mouse CD1.1 decrease as thymocytes mature and become peripheral T cells. We also examined the relative levels of CD1.1 expression by various classes of APCs. Adherent/de-adherent, in vitro-purified splenic dendritic cells expressed very high levels of CD1.1, approximately three times above that of the majority of splenic B cells (Fig. 4⇑, compare A and C). Among fresh peritoneal macrophages (Mac-1+), the I-A+ subpopulation expressed higher levels of CD1.1 (Fig. 4⇑B), suggesting that subsets of macrophages that are naturally activated also overexpress CD1.1. 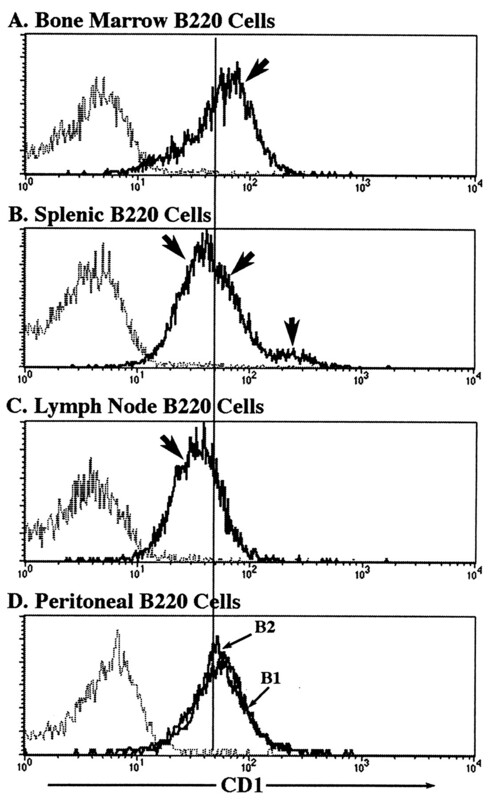 Finally, the bulk of splenic B cells (B220+) expressed CD1.1 at levels similar to those of cortical thymocytes (Fig. 4⇑C, and compare Fig. 3⇑, A and B), although approximately 6 to 8% of splenic B cells expressed CD1.1 at very high levels (Fig. 4⇑C, and see below). We next investigated the relative levels of expression of CD1.1 on B cell subsets in the spleen and other sites, using B220 to identify B cells. CD5 was also used to exclude T cells in the spleen and lymph node and to define the B1 B cell lineage (Ly1, or CD5+, B cells (35)) in the peritoneum. CD1.1 levels may decrease slightly as B cells develop into mature B cells, since the levels of CD1.1 on (mostly immature) bone marrow B cells were slightly higher (1.7 fold) than on (mostly mature) lymph node B cells (Fig. 5⇓, compare A and C). Both conventional B2 B cells and B1 (Ly1) B cells in the peritoneum expressed CD1.1 at levels equivalent to bone marrow B cells (Fig. 5⇓D). B cells in the spleen showed three distinguishable levels of CD1.1 expression (Fig. 5⇓B, arrows). The largest population of splenic B cells expressed a level of CD1.1 that was equivalent to that observed on the mature lymph node B cells. A second population of B cells in the spleen expressed CD1.1 at levels comparable to that of B cells in the bone marrow. Finally, a small but distinct B cell population expressed very high levels of CD1.1. CD1.1 expression by B cell subsets. Cell suspensions were blocked with an anti-FcR mAb, and then stained with anti-CD1.1 biotin (19G11) + streptavidin-PE, anti-B220-CyChrome, and anti-CD5-FITC, and gated on B220+, CD5− cells to identify B2 B cells in all sites, and on B220+, CD5+ to identify B1 (CD5+) B cells in the peritoneal populations. Control staining with the second step reagent streptavidin-PE (SA-PE) alone is shown for comparison. Arrows are used to point to different populations of B cells that are found in the spleen and other sites. The vertical line is introduced as a reference to compare CD1.1 levels on B cell populations in the different sites. To more clearly identify the different splenic B cell populations, additional markers were used. In the spleen, the B cells that express the highest levels of the marker HSA (heat-stable Ag) have been identified as recent bone marrow emigrants (36); thus, the HSAhigh status of the CD1int population suggested that they were recent bone marrow emigrants (Fig. 6⇓, HSAhigh, CD1int). In conjunction with an HSAlow phenotype, the CD21int, CD23high, and IgMlow phenotype of the bulk population of splenic B cells (Fig. 6⇓) indicated that they were mature follicular B cells (37, 38, 39, 40). MZB cells express the highest levels of CD1.1. Spleen cells were blocked with an anti-FcR mAb, and then stained with anti-B220-CyChrome, anti-CD1.1 biotin (19G11) + streptavidin-PE, and FITC-HSA, -CD21, -CD23, or -IgM. Two-color dot plots were generated after gating on B220+ cells. Background levels with either streptavidin-PE alone or directly conjugated Abs on negative cell populations were set within the first decade of the plots (data not shown). 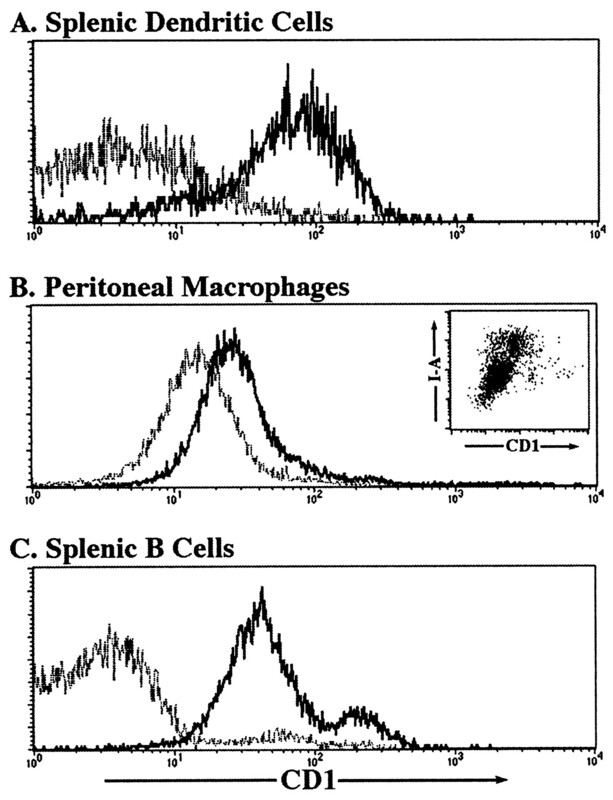 The most intriguing population of splenic B cells, though, were those that expressed very high levels of CD1.1 (Figs. 5⇑B and 6; see also Figs. 3⇑A and 4C). These CD1.1high cells, which expressed seven times more CD1.1 than the bulk population of B cells, were also clearly distinguished by their HSAint, CD21high, CD23low, IgMhigh, IgDlow phenotype (Fig. 6⇑, and data not shown for IgD), and by their larger size (mean FSC of 428 vs 321 for the rest of B cells, data not shown). They did not appear to be B1 B cells based on CD5 expression (data not shown). Furthermore, the HSAint and CD21high phenotype of these cells clearly distinguishes them from the immature B cells that have recently emigrated from the bone marrow. Thus, the phenotype of the CD1high B cells is most consistent with that of MZB cells (37, 38, 39, 40). This conclusion is in accordance with the fact that C3H mice, which were reported to have an increased number of MZB cells (40), also had an increased proportion of CD1.1high B cells (32% of C3H B cells are CD1.1high, as detected by the CD1.1-specific mAb 15F7, compared with 12% of C57BL/6 B cells, data not shown). Finally, immunohistochemistry (Fig. 7⇓) confirmed that the cells that were CD1high did indeed localize to the splenic marginal zone. In conclusion, the results demonstrate that the CD1high phenotype is characteristic and specific of splenic MZB cells. The CD1high B cells localize to the splenic marginal zones. Frozen sections of a C57BL/6 spleen (A) double stained with peanut agglutinin (red) and anti-CD1.1 (blue). GC, germinal center; MZ, marginal zone. B, The blue CD1 staining is absent in the control CD1-gene knockout mouse (S.-H. P, manuscript in preparation). The conservation of CD1 genes in mammalian species (1, 2) and the discovery that CD1 and MHC map to two paralogous regions of the genome that likely arose from the chromosomal duplication of an ancestor locus more than 100 million years ago (41, 42) are strong indications that CD1 may have evolved to perform important and original immune functions (3). Despite their association with β2m, there is strong evidence that CD1 molecules such as human CD1b may function in an MHC class II- rather than class I-like manner, sampling the endosomal compartment and loading hydrophobic ligands such as bacterial cell wall glycolipids endocytosed through binding to surface mannose receptors (6, 8, 43). Mouse CD1.1 and its human homologue, CD1d, have been implicated in presentation of foreign Ags to T cells, as CD1-restricted, peptide-specific T cells have been elicited in vivo (10). The normal intracellular pathways of Ag presentation by mouse CD1.1 and their significance remain to be elucidated, however. An important step toward understanding the enigmatic immune function of CD1.1 is to define its pattern of expression in normal tissues and cells, and to identify the cell types that express the highest surface levels. In this study, we described the largest panel of mAbs to CD1.1 produced to date, and we defined at least four clusters of CD1.1 epitopes. Taking advantage of our observation that the nearly identical CD1.2 molecule is not expressed at the surface of C57BL/6 cells4 and seems to be poorly if at all expressed in other mouse strains (S.-H.P. and A.B., unpublished observations), we could focus on the expression of the relevant CD1.1 molecule in vivo. Using mAbs that recognized CD1.1 independently of N-linked carbohydrates, we confirmed that CD1.1 was expressed on the surface of transfected cell lines as well as fresh thymocytes as a β2m-associated, heavily N-glycosylated protein. Surprisingly, although five of the mAbs of the panel consistently and completely blocked CD1.1 recognition by all members of a panel of 12 autoreactive T cell hybridomas, we found that the two previously reported anti-CD1.1 mAbs, 3C11 and 1B1, as well as three mAbs of our own panel could only block CD1.1 recognition by some, but not other, T cell hybrids. The molecular basis of this unusual observation remains to be established. It is possible that these mAbs only recognize a subset of the CD1.1 molecules expressed on the surface, possibly because they are sensitive to glycosylation or to ligand-induced conformational changes. In any case, this result emphasizes the value of assessing CD1.1 expression with a larger panel of mAbs, and most importantly from a functional point of view, with mAbs that consistently block T cell recognition of CD1.1 molecules. We confirmed the previously reported conclusion (22) that CD1.1 is expressed by cells of hemopoietic origin. In addition, we examined the relative levels of expression among the different cell types of hemopoietic origin, and made the observation that they vary in a manner that is suggestive of function. Although mature T cells expressed low levels of CD1.1, cell types endowed with the ability to introduce foreign Ags to the immune system, including dendritic cells, MHC class II+ macrophages, and B cells, expressed the highest levels of CD1.1. Most remarkably, a minor subset of B cells expressing very high levels of CD1.1 was found and identified as the splenic MZB cell population. This observation may shed light on the enigmatic function of CD1.1. Indeed, the MZB cell is a phenotypically and functionally distinct cell type (44) that may be involved in some innate forms of B cell responses (45, 46). Unlike dendritic cells, which can survey the peripheral tissues and return to the lymphoid system displaying foreign Ag and costimulatory molecules, the MZB cell is a fixed resident of the spleen. Nonetheless, the histologic location of MZB cells is at the point where blood enters the spleen through the marginal sinuses, so that MZB cells are well situated for the capture of blood-borne pathogens. In addition, marginal zone B cells express high levels of the complement receptor CD21 (37), which greatly enhances the B cell response to complement-coated Ags (47). The strategic location of MZB cells and their expression of CD21 make them remarkably well suited therefore for the capture of complement-coated bacteria. A number of studies suggest that MZB cell responses could be amplified or switched through cytokines released by nonconventional helper cells. Such help could be provided by NK cells (48), which seem to localize preferentially to the splenic marginal zone (46), or might come from CD1-restricted T cells, which are known to very promptly secrete cytokines such as IL-4 and IFN-γ. Indeed, NK1.1+ CD1-specific T cells share with at least some MZB cells (49) several unusual characteristics, including the expression of self-reactive, germline-encoded Ag receptors, and of receptors associated with the innate immune system, suggesting a function at the early, innate, phase of immune responses. The fact that CD1 family members may specialize in presenting bacterial glycolipids (3) further strengthens the idea that CD1high MZB cells and CD1-specific NK1.1+ T cells could be involved in some important aspects of innate responses to blood-borne microbial pathogens. We thank Andy Beavis, Bana Jabri, and Delphine Rea for technical advice; Darren Hasara for help with the mouse colonies; and Marty Marlow-Fonseca for help with mAb generation. ↵1 This publication was supported by Grant AI38339 from the National Institutes of Health, a Cancer Research Institute Investigator Award, and a grant from the Mallinckrodt Foundation. J.H.R. was supported by a postdoctoral fellowship from the Juvenile Diabetes Foundation. 3 Abbreviations used in this paper: β2m, β2-microglobulin; MZB, marginal zone B cell; DP, double positive; HSA, heat-stable antigen; PE, phycoerythrin. Dempsey, P. W., M. E. D. Allison, S. Akkaraju, C. Goodnow, and D. T. Fearon. 271. C3d of complement as a molecular adjuvant: bridging innate and acquired immunity. Science 271:348.